We had the opportunity recently to catch up with Lauren Skiver, the CEO & General Manager at SunLine Transit Agency. Moving nearly five million riders annually, SunLine delivers public transportation in California's Coachella Valley region that ecompasses Desert Hot Springs through to Palm Spring. Insights on her experience with zero-emission fuel cell bus deployment are shared – read the full Q&A here. The SunLine Transit Agency operates 14 local fixed routes, one express line, and the Riverside Commuter Link. In the fiscal year 2015-2016, they operated 4.3 million revenue miles for 4.5 million passenger rides. Today, they offer direct employment to over 300 people in the community. The Agency is progressive and an ardent supporter of alternative fuel solutions, and includes a number of hydrogen-powered fuel cell electric buses within its fleet. Q: What were your expectations regarding implementing the zero-emission bus technology? The SunLine Transit Agency has a long history of supporting this mission. It was part of the board’s mandate long before I arrived on the scene. But since getting here I have become an ardent advocate for this technology. Q: Regarding implementing the program, what were the challenges? Costs: Certainly there are the costs of the systems and buses, but there are funding opportunities to help offset them. The more miles we put on the FC Buses, the more data we have to evaluate on technology reliance and performance. This information helps validate our commitment to zero emission and, in turn, supports the funding requests we submit. Culture: Internally, as an organization, we are mission focused on alternative fuel use. From the board level, right down to operations, our entire team understands the commitments we have made to our ZEB program. Sure - it is great for the board and upper management of a transit agency to mandate the alternate fuel mission, but if the support doesn’t happen throughout the entire organization, it just won’t work. "Everyone must be on board. Maintenance and operations support is critical as they are responsible for the deployment of the buses on a daily basis. 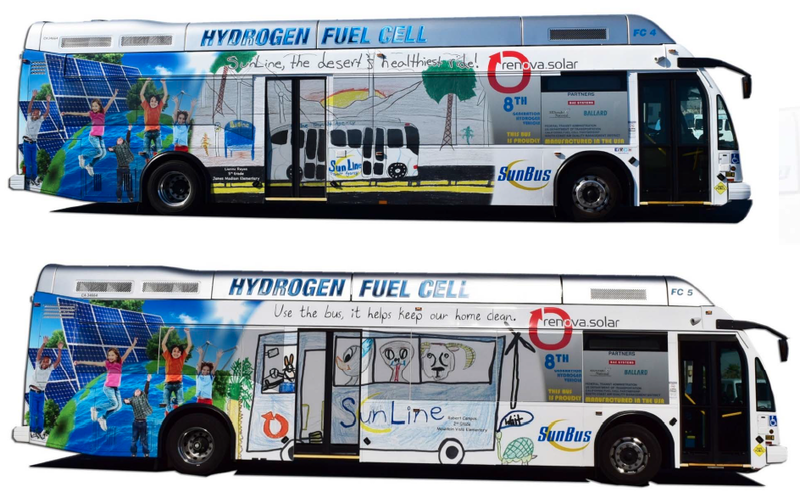 This cultural item defines which transit agencies has the appetite for embracing fuel cell technology." Data: We have put the systems in place to accurately review the performance, costs, lifecycle and reliability of our fleet. As mentioned earlier, data validation is a big component of the grant application process. The more complete the data, the better chance you have of accessing the public funds to offset the costs of these systems. Operations: It’s not really a challenge, but we needed to treat the FC buses like any other bus in our fleet. They are not garage queens. The buses need to be deployed in all conditions. We treat our fuel cell buses just like any bus platform in our fleet. Another challenge we see is the commercialization of the hydrogen technology. It does impose limitations on the wide scale deployment of FC Buses. Increasing the hydrogen fueling infrastructure options would greatly enhance the viability of commercial fuel cell bus solutions. Q: What were the impacts on your community? What were you measuring, and were there any surprises? There is a great appreciation for the zero-emission buses in our community. We run a contest whereby school kids submit designs for bus graphics. We select a couple of them and wrap the entire bus in these drawings children have created. It symbolizes our environmental efforts and connects us to the community. As we deploy our FC buses like any other bus, they have become, just part of the fleet. Some members of public have commented on the smoothness of the ride, but as a whole they are well integrated into our fleet. Q: What are the financial implications? Were there any surprises? We direct efforts to apply for the many government funding programs that embrace zero-emission solutions. This funding helps us further develop the systems and mature our FC bus infrastructure. The promise of ongoing funding mechanisms is always a concern, but there seems to be an appetite for reducing our dependence on fossil fuels. Operationally, our hydrogen fleet is used just like our other platforms and is well integrated into our maintenance program. The total cost per mile is comparable to CNG buses we have in service. Q: If you were to redesign the program today and start from scratch, what would you change or do differently? Oh, I think a lot of groundwork has been undertaken to get us here. Transit agencies who are considering this solution would benefit from the industry establishing a Center for Excellence. For every investment in technology there should be an equal investment in training and learning. This needs to be shared with everyone. We need to find ways of implementing a repeatable process. This will include acquisition and in-service management, leveraging prior investments and prevents duplication in future technology projects. The best part is that the solutions we are developing can be transferred to other motive applications, such as light rail. Q: Are the fuel cell buses meeting your availability expectations? Yes, as mentioned earlier, we treat FC buses just like any other in our fleet and they are meeting availability targets. Q: What does the future of green bus propulsion technology look like? Battery-electric technology is evolving. I think that the future is a hybrid solution that embraces both hydrogen and battery power. They both seem to support one another. Prior to arriving at Sunline, Lauren Skiver was the CEO for the Delaware Transit Corp. Follow #zeroemissionbus2016 on Twitter for more conversation on this topic. For more information, read the latest whitepaper on Fuel Cell Electric Buses, which includes case studies of fuel cell buses in operation and how to overcome potential barriers of deployment. Overview of Current Barriers to a Wider Adoption of Fuel Cell Electric Buses & their Benefits for UK Transit Operators.